Offers assurance that sample resistance is within acceptable range for electroporation. This feature protects precious sample as well as system component to safeguard against arcing. Provides researchers with the widest range of voltage options available in the market. 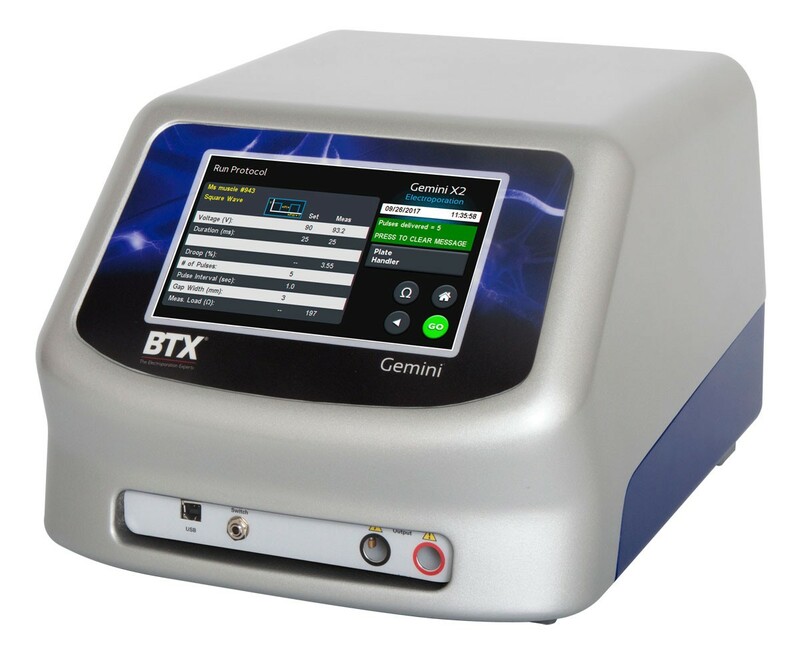 The Gemini X2 can achieve voltage delivery as low as 5 V and as high as 3000 V in both waveforms in addition to pulse lengths of 10 µs to 5 s, from delicate in ovo tissue to hearty gram positive bacteria. 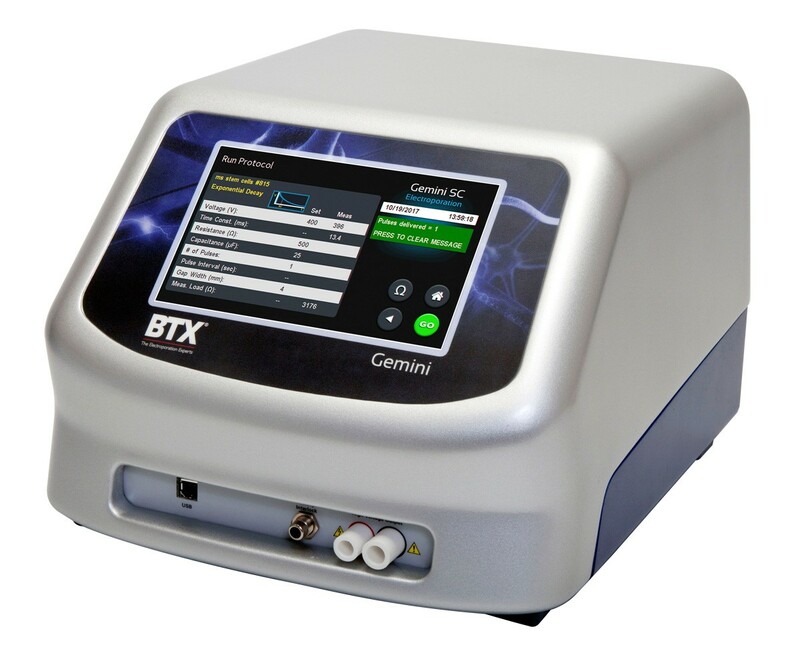 The Gemini SC can achieve voltage delivery as low as 10 V and as high as 3000 V in both waveforms in addition to pulse lengths of 50 µs to 5 s.
Delivers precise voltage, pulse length/time constant, pulse interval and displays the values back to the researcher allowing for visual confirmation of successful electroporation. Gives researchers peace of mind knowing that their sample and their systems are safe from troublesome arcing with enhanced 4-way safety checks through the pulsing procedure. Using two separate pre pulse, sample resistance monitoring scans to ensure proper conditions, as well as internal safety features auditing pulse progress in at the component as well as software level, arcing is dramatically decreased. The Gemini is intended For Research Use Only. Not for use in diagnostic, pre-clinical, or clinical procedures. Kuo CY, Lin CH, Hsu T. VHL inactivation in precancerous kidney cells induces an inflammatory response via ER stress-activated IRE1α signaling. Cancer Res. 2017 Jul;77: 3406-3416. Lopes A, Vanvarenberg K, Preat V, Vandermeulen G. Codon-Optimized P1A-Encoding DNA Vaccine: Toward a Therapeutic Vaccination against P815 Mastocytoma. Mol TherNucleic Acids.2017 Sep;8: 404-415, 2017. Sun, L. et al. Glutamine is required for snakehead fish vesiculovirus propagation via replenishing the tricarboxylic acid cycle. J Gen Virol, 2016 Nov;97(11): 2489-2855. Wang, Y. et al. Autophagy induced by snakehead fish vesiculovirus inhibited its replication in SSN-1 cell line. Fish Shellfish Immunol. 2016 Aug;55: 415-422. Stanga, S. et al. APP-dependent glial cell line-derived neurotrophic factor gene expression drives neuromuscular junction formation. FASEB J. 2016 May;30(5): 1696-1711. Cameron, DE, Collins, JJ. Tunable protein degradation in bacteria. Nat. Biotech. 2014 Dec;32(12): 1276-1281.